This book introduces the reader the chemistry of reaction approaches by which noble metal nanoparticles are synthesized, including synthetic approaches using the Brust-Schiffrin method , a high-temperature solution-phase synthesis, polymer and biological entities, weak and strong reducing and capping agents, the low and high temperatures, various additives and various novel approaches such as plasma, ionic liquids, UV light and gamma rays and others. 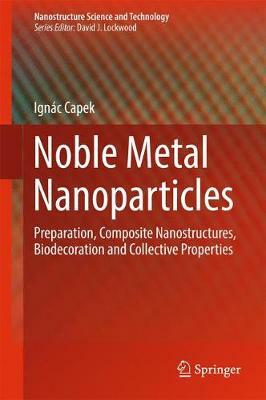 This book starts with a brief overview of foundation work concerned with the chapter topics such as nanomaterials, nanoscience, surface-capping molecules, traditional and nontraditional reduction agents, In addition, chemical and physical properties of noble metal nanoparticles with different structures and elements such as monolayered clusters, nanorods, and bimetallic nanoparticles are described comprehensively. The aim is to summarize the fundamentals and mechanistic approaches in the preparation and characterization of metal colloidal nanoparticles and dispersions. In this way the reader is provided with a systematic and coherent picture of the interesting field of nanoscience based on noble metal colloidal nanoparticles. Intended as a wide-ranging overview, the book is a resource for novices in the field as well as for specialists, particularly those scientists working in the area of nanoparticle synthesis. Nanoscience and nanotechnology are discussed from the chemist's point of view. Therefore, this volume describes in detail the terms, definitions, theories, experiments, and techniques dealing with the synthesis of noble metal nanoparticles. The material presented here is essential reading for research chemists, technologists, and engineers in the fields of specialty nanomaterials and metal industries, and also is highly valuable for researchers in university, institutional, and governmental laboratories, especially for those at advanced stages of their careers.